Graduation season is approaching quickly, so it’s time to start planning something special for the graduate in your life. Whether your child is moving on to first grade, junior high or high school, celebrate the big milestone with these five unique and meaningful gift ideas. 1. Books. Dr. Seuss’ classic Oh The Places You’ll Go (“Congratulations! Today is your day. You’re off to Great Places! You’re off and away!”) is a favorite gift for graduates, but there are lots of other inspiring, funny or encouraging books that would be ideal for the occasion. Tailor your selection to his or her interests. For a poetry lover, go for Where the Sidewalk Ends. For a future world traveler, pick The Lion, the Witch and the Wardrobe or Where the Wild Things Are. If you can’t decide,Chicken Soup for the Kid’s Soul or Don’t Sweat the Small Stuff… And It’s All Small Stuff are excellent choices. 2. Survival Kits. Put together a homemade “survival kit” for whatever new school your child is attending in the fall. For a new first grader, a pencil box full of sharpened pencils, crayons and erasers is a good start. Include colorful binders, notebooks and a reusable lunch bag and put everything in a small backpack. If your graduate is going on to junior high school, you could include a journal, a day planner, magnetic mirrors or picture frames for a locker or gear for a favorite sport. 3. Dinner Out. Instead of a giving your graduate a present to unwrap, treat him or her to a dinner out at a favorite restaurant. Dress up and indulge in delicious food (maybe even ending in a hot fudge sundae or a piece of apple pie), while toasting with sparkling cider. 4. A Scrapbook or Photo Album. Start a scrapbook or photo album with mementos from your child’s life so far, leaving room for him or her to fill in pages and help personalize it. Get crafty with supplies from your local art store or take advantage of technology and create a gorgeous and inexpensive photo book online at Blurb.com. 5. A Party. Everyone loves a good party, so forego the gifts and throw a BBQ, pool party, sleepover or laser tag outing instead. All kinds of themed invitations are easy to find and customize at tiny*prints. 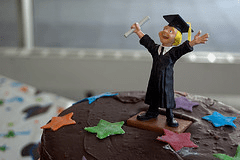 Let the graduate help plan the festivities, and it will be a memorable celebration.